Farlaine the Goblin is a series of fantasy graphic novels published by Studio Farlaine and written and drawn by the cartoonist who goes by the nom de plume, “Pug Grumble” (but who was previously credited as “Anonymous”). Mr. Grumble has been providing me with PDF review copies of the recent Farlaine editions. Each Farlaine comic book/graphic novel is published as a paperback (landscape dimensions 11.8” x 7.75”). The story focuses on Farlaine the Goblin, a tree goblin and a shaman from the forest of Fin-Din. He has spent years wandering the many “Oddlands of Wug” in search of a forest that he can call his own. Farlaine has two companions. The first is Ehrenwort, a tree he carries in a sack on his back; Farlaine (pronounced “Far-Lin”) also talks to Ehrenwort, whom he describes as his “Verdan.” The second companion is a “Tink” whom Farlaine met in an earlier adventure in the “Tinklands.” A rotund, mechanical fellow (think Star Wars' BB-8 with two wheels), he has been named Drowsy by Farlaine. Farlaine the Goblin: Book 7, The Final Land opens to find Farlaine, Ehrenwort, and Drowsy leaving The Winglands, or at least trying to leave. And the bully dragon our heroes met in The Vaultlands (Book 5) is still vexing them. To complicate matters, fate takes the gang back to The Tinklands, the home of Drowsy! Now, The Tinklands, lacking “Tinks,” is up for grabs. Fill it up with enough of something, and that is what that land becomes. For instance, The Tinklands could become a peg-leg land! For Farlaine, this could also become the end of his journey. He is running out of lands, and Ehrenwort may be dying. To save her, Farlaine and Drowsy will have to use all of their imagination, but most of all, they will need to call forth what is good and true within them. THE LOWDOWN: Pug Grumble gave me copies of Farlaine the Goblin, Trade Paperback, Volume 1, which collects the first three graphic novels in the series, and also Book 4 back in 2015. I read them and fell in love with Farlaine the Goblin. I have been a fervent supporter of Grumble's efforts, and I have been doing my part to spread the good word about a certain goblin's good work. Now, we come to the release of the final book, Farlaine the Goblin: Book 7, The Final Land. It is fitting that Book 7's variant cover edition features cover art by David Petersen, whose Mouse Guard fantasy comic book series, became a huge hit after Petersen originally self-published the first issue. Farlaine is like Mouse Guard in that both are great fantasy comics not published by biggest North America's biggest comic book publishers. Yet both Grumble and Petersen's talent and work shine, and their comics are as good as anything published by a major comic book publisher. When I read Farlaine, I feel as if I have entered a venerable library, and after perusing the shelves, I have found a leather bound volume. Upon opening it, I discover something old, but timeless. Farlaine the Goblin is a new work, but it brims with old magic, as if it belongs right alongside The Hobbit and The Wind in the Willows. I feel that way whenever I reread the first issue of Neil Gaiman's beloved fantasy comic book series, The Sandman. While Farlaine the Goblin is new and unknown to so many readers, readers that will discover it in the future will discover a classic fantasy tale infused with the sense of magic that classic fantasy must have. 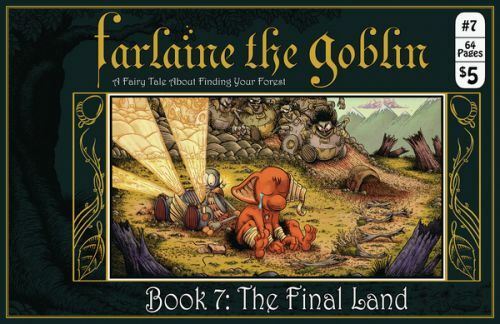 Farlaine the Goblin: Book 7, The Final Land is a great final volume. Its themes of forgiveness, redemption, friendship, reinvention, and discovery make this story sparkle with possibilities. That makes Farlaine seem as if his story is ending with him being a goblin in full. Farlaine the Goblin: Book 7, The Final Land is not about finality. Farlaine will go on “happily ever after” even if his creator never engages him again. He will always be there waiting for new readers to enter a library or a bookstore and to discover his journey.